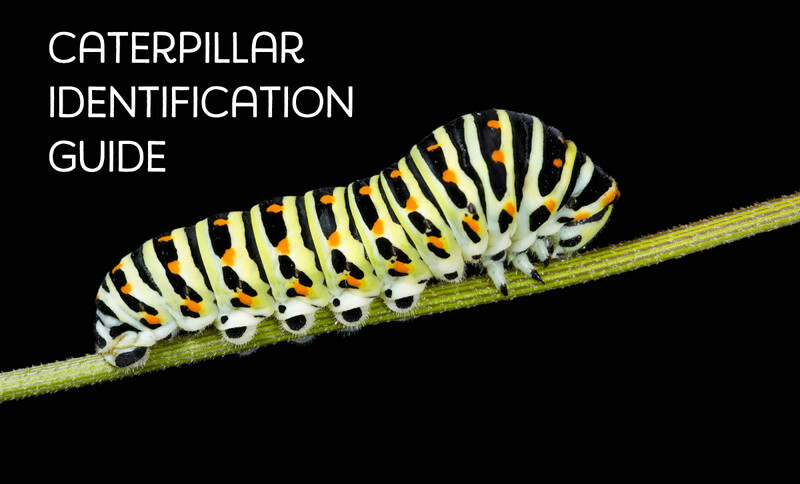 This guide will help you identify the striped caterpillar that you found. Identification of caterpillars, like all insect species, relies on certain characteristics, and it can be difficult to tell them apart. This guide is meant to be quick and easy to use. All insects have a scientific name, and many have a common or popular name. 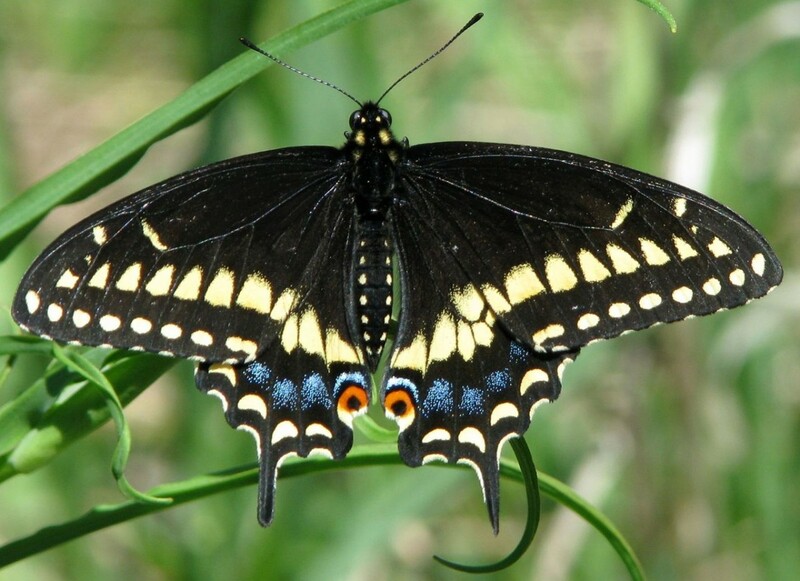 For example, the insect with the scientific name Papilio glaucus is commonly known as "the tiger swallowtail butterfly." This guide will give you both the scientific and the popular name, if there is one. What does It Eat? Every caterpillar has specific trees and plants that it eats. Will it seriously damage plants or trees? 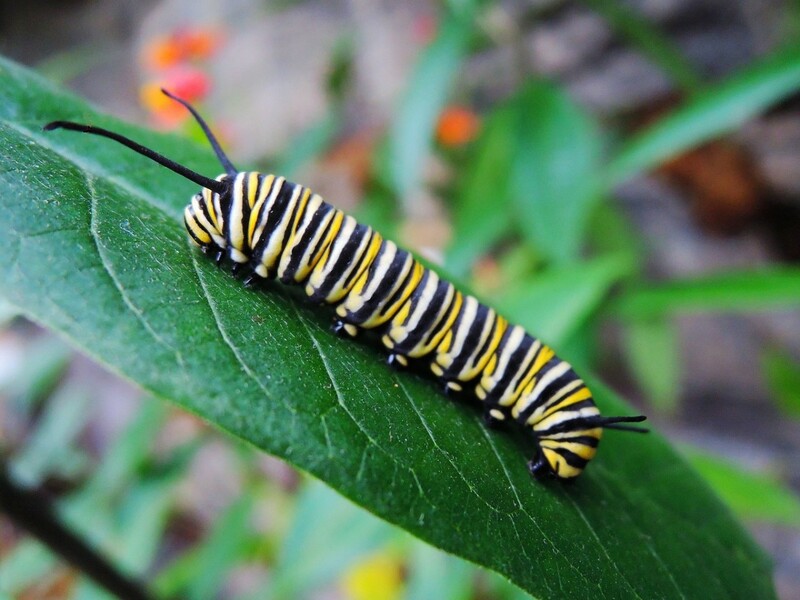 Most caterpillars do little to no damage, but a few pest species can really destroy a garden, or even a forest. A few species, some with stripes, need to be reported to authorities to protect the local environment. Is it rare? The striped caterpillar you found may be an unusual species! What does it turn into? 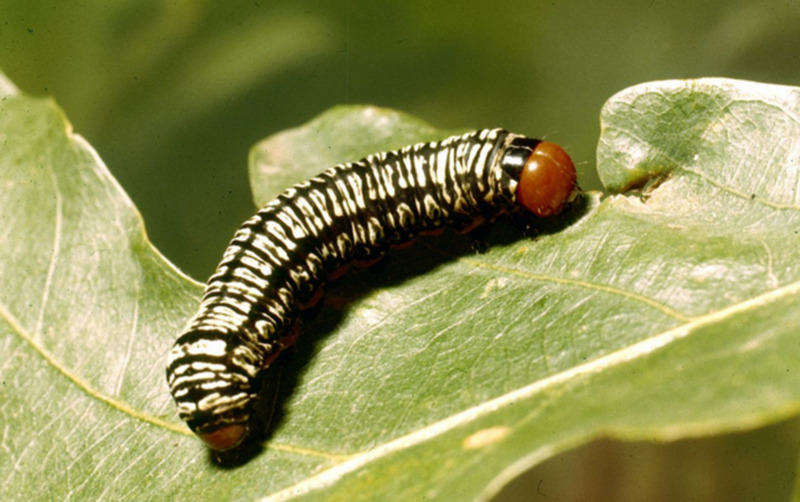 Caterpillars are the immature form of butterflies and moths. Your striped caterpillar will turn into some kind of winged adult, and some are very beautiful. Can you raise it to an adult? It's possible to keep a caterpillar and raise it to the moth or butterfly. You will need to know what it eats, and be patient while it grows and changes into the adult. The iconic butterfly has an equally iconic caterpillar. The adults are highly photogenic, and their well-documented migrations, in which they wind up wintering in the millions in a small patch of forest in Mexico, has captured the attention and awareness of people who otherwise know little about butterflies. 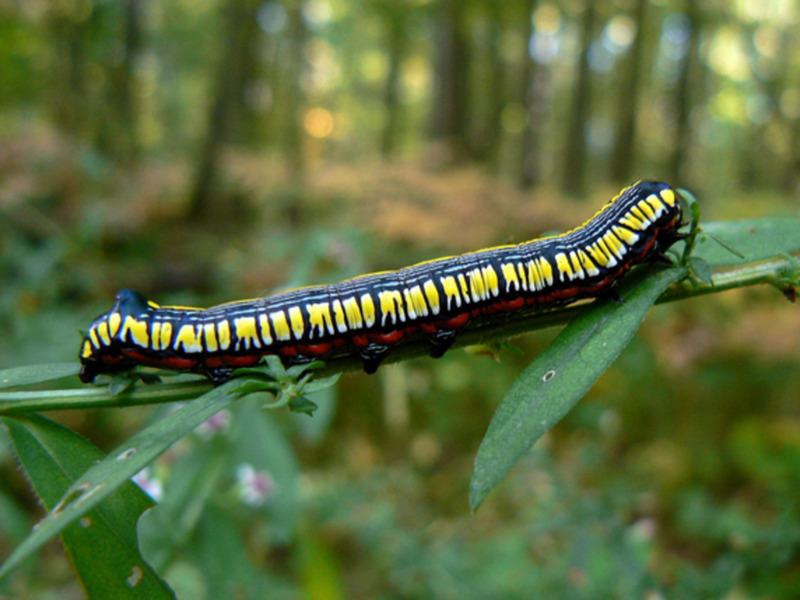 The cool striped caterpillar feeds only on milkweed, with an apparent preference for swamp milkweed. The adults lay eggs on the plant and the caterpillars eat the leaves. It's thought that the toxic sap of the milkweed plant (the "milk") imparts toxicity to the caterpillars, protecting them from predators. But at in my experience at least they're not protected from wasps and other insect predators -- I have seen them wipe out an entire population from my backyard milkweed patch. 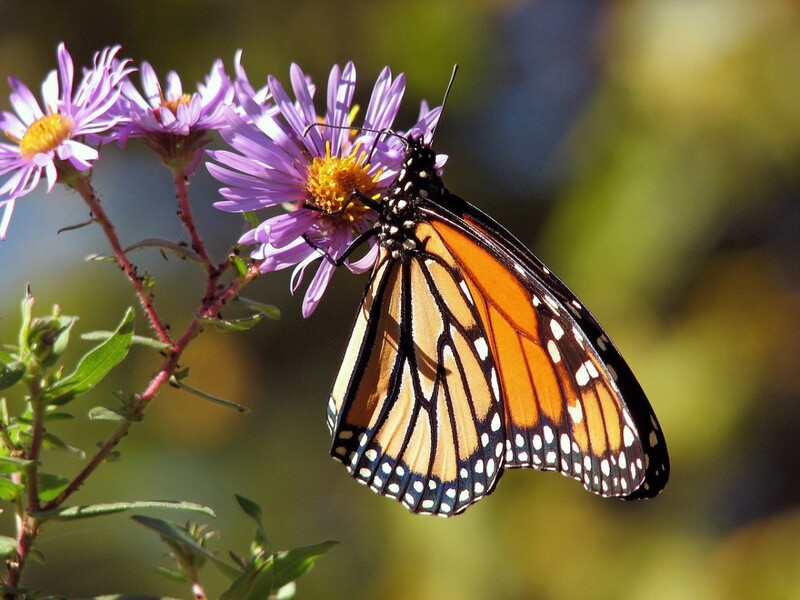 This butterfly is a lesser-known relative of the more wide-spread monarch butterfly (above). The queen occurs in the southern United States, down through Mexico and into Central America, where it is one of the most common species to be found (and the monarch is very seldom seen).Interestingly, in areas where the queen is more common than the monarch, a butterfly called "the viceroy" that mimics the monarch has developed to mimic the queen instead. The queen resembles the monarch but is a darker "burnt-orange" color and is a bit smaller. 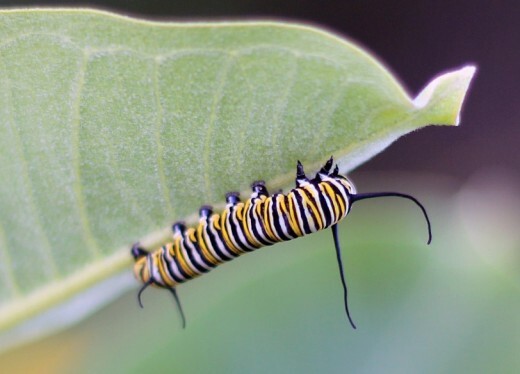 The caterpillar is also similar to the monarch but has more sharply defined stripes and an extra pair of tentacles on the back. Is it rare? No, although the species is not typically found in northern areas. Occasionally confused with monarch caterpillars by people who aren't looking too closely, this caterpillar has a fascinating natural history of its own. They eat carrots, parsley, dill, and occasionally rue, which may give them a chemical protection due to those plants' bad-tasting sap. And like all swallowtail caterpillars, this species has a forked, bad-smelling organ called "osmeteria" that it can evert from behind its head. This organ looks like a snake's tongue and my deter predators. 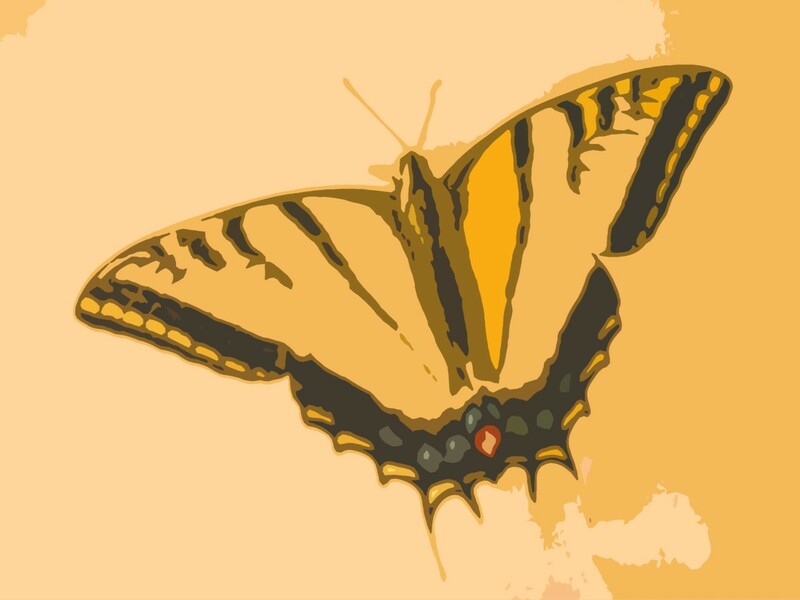 The butterfly is big and beautiful, and often seen visiting gardens to lay eggs on leaves. Will it seriously damage plants or trees? Not really, although if you eat a lot of parsley you may find yourself competing with them. 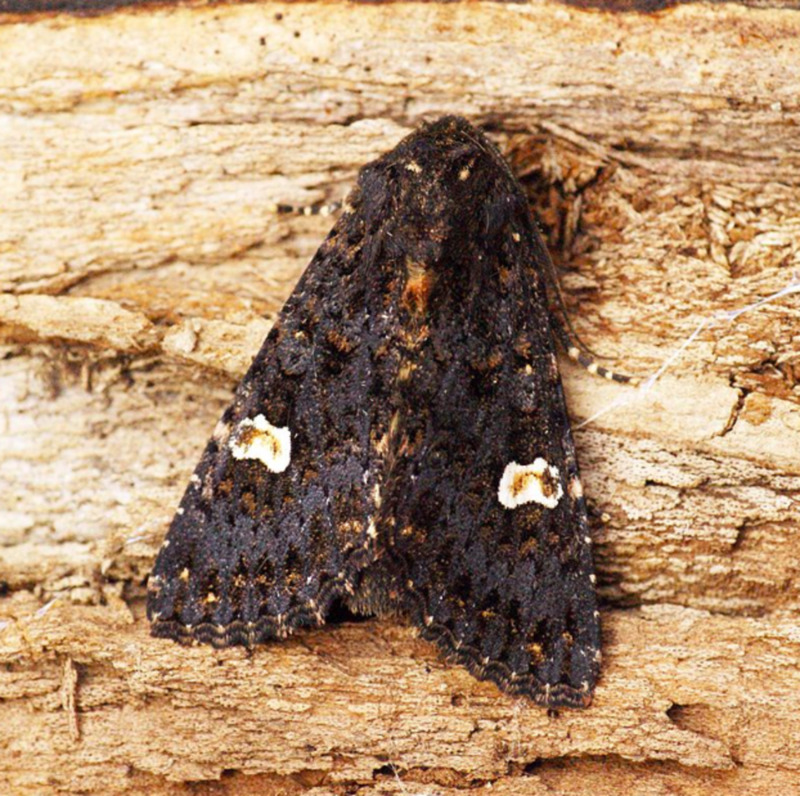 This moth occurred only in Europe before it was introduced into New Zealand, Australia, and North America, primarily as a measure to control ragwort. This has proven to be effective, as the caterpillars are voracious feeders on this plant and can keep it from spreading as fast as it might. 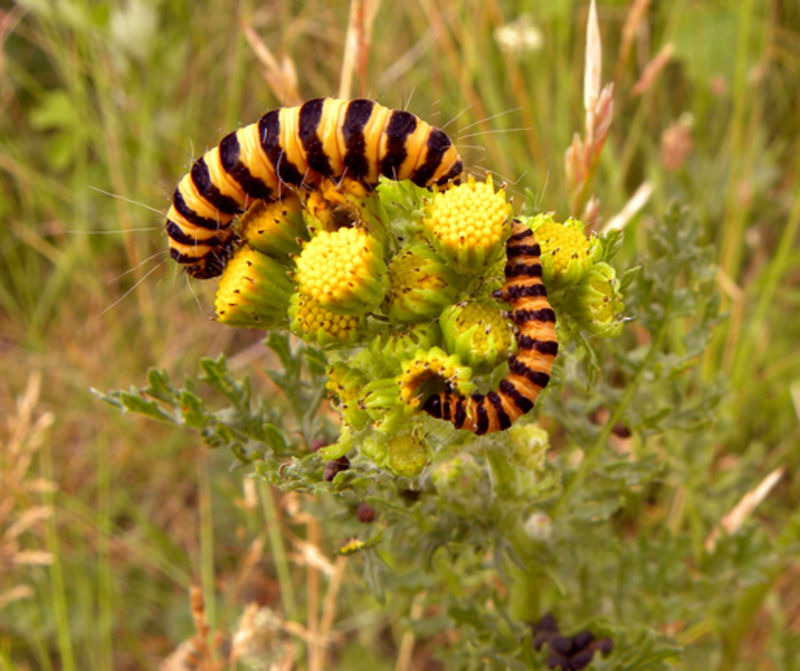 They eat so much that they often strip a patch of ragwort of all of its leaves, and then turn to eating each other! 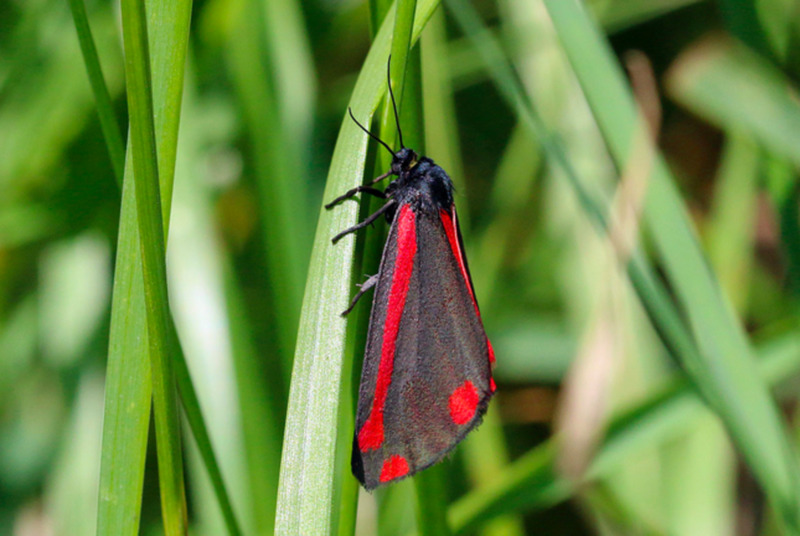 The striking black and yellow caterpillar turns into a truly beautiful moth, with bright scarlet markings on rich brown wings (although occasional yellow-marked individuals have been known to occur). 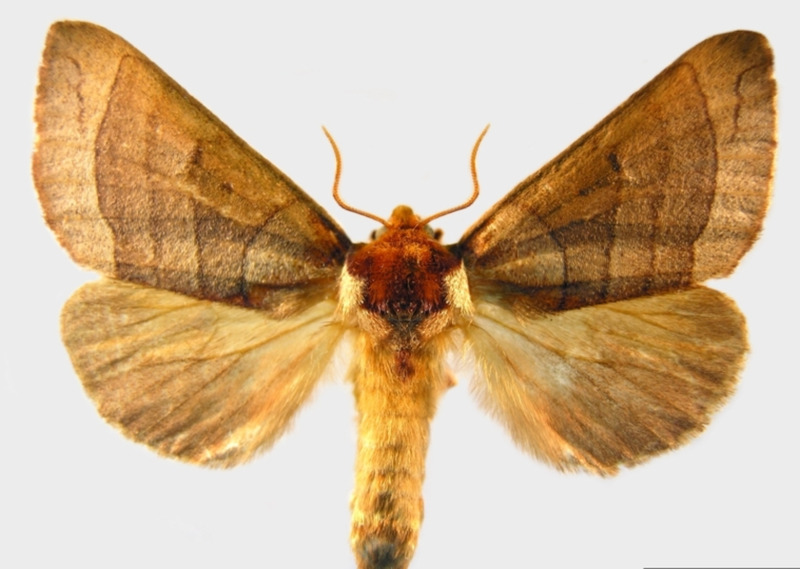 The moth flies during the day, and its bright colors suggest that it's protected by having a bad taste to predators. 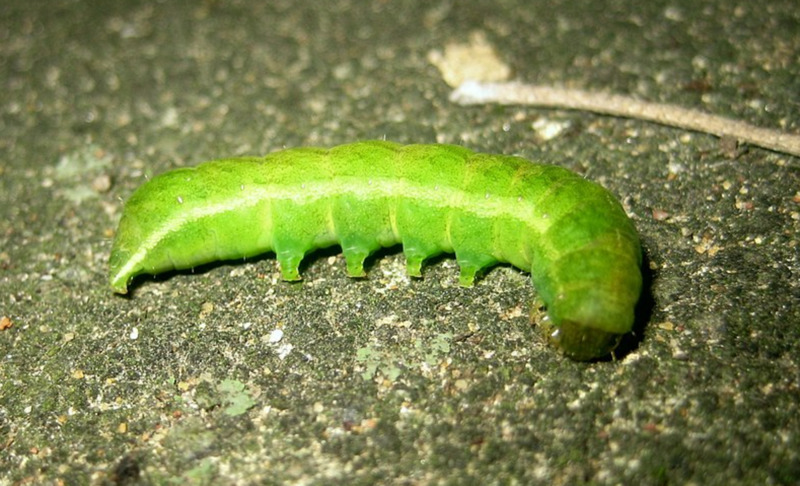 This caterpillar is among the most commonly-encountered garden "worms." 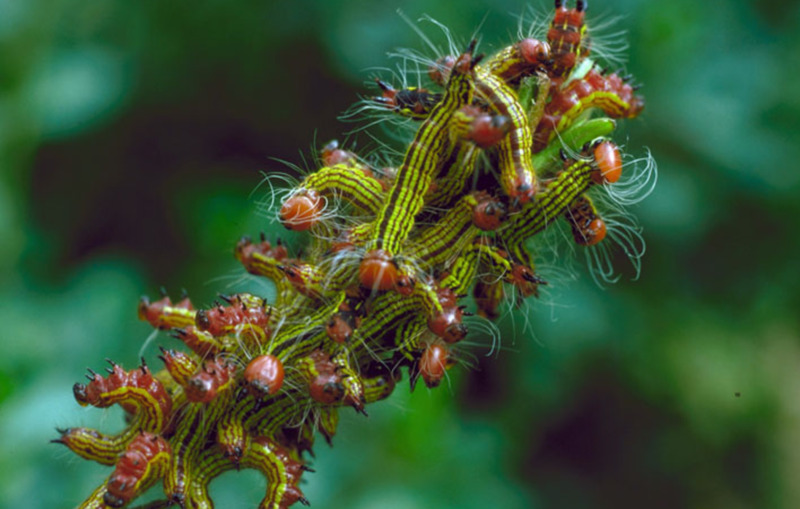 It belongs to a large family of similar species, and many of them are quite commonly found -- in fact, it's best to think of this caterpillar as a group of nearly identical insects that will all take a bite out of your garden. The striped garden caterpillar eats almost anything, and close relatives are those caterpillars you sometimes find eating away inside an ear of corn. 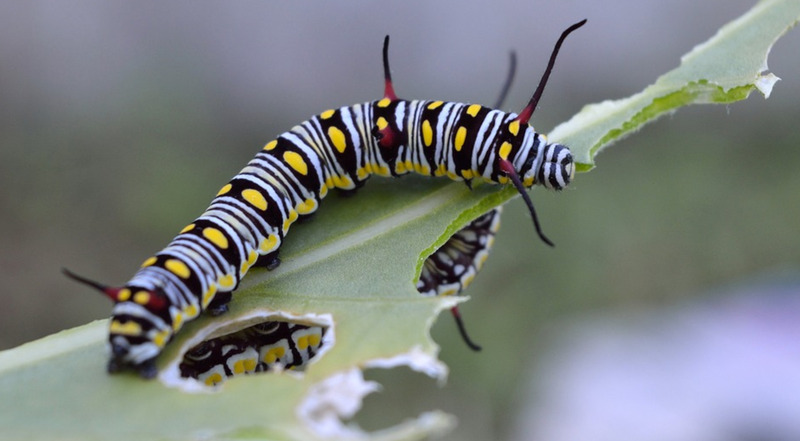 There are several ways to control these common garden pests, but the one I prefer is picking them off and smashing them into your compost pile. The moth that these caterpillars grow up to be is a rather plain brown number that you will often see flying around your porch lights. It takes a specialist to tell some of the moths apart. Is it rare? No. This species is found almost everywhere. Here's where it gets interesting. Diatomaceous Earth is not toxic, and is not a poison -- it kills insects because when they crawl over it the jagged silica shells left behind by the diatoms make little scratches and cuts on the insect's underside. This damage is typically fatal. When picking caterpillars off a plant won't work, I will use Diatomaceous Earth. It's non-toxic and kills insects without chemicals of any kind. This product is "food grade" meaning it's actually safe enough to eat (in fact some poeple take it as a dietary supplement). This is a very cool species that will sometimes occur in large numbers. At this time you may may find them crawling on the ground, usually in the vicinity of an oak tree. You can tell the female caterpillars from the males by size -- the female ones are much larger than the males. They all have a sherbet-orange ground color with thin black stripes and black, knobby "horns." There are closely related species that have pink or yellow stripes, but orange is the most common color. 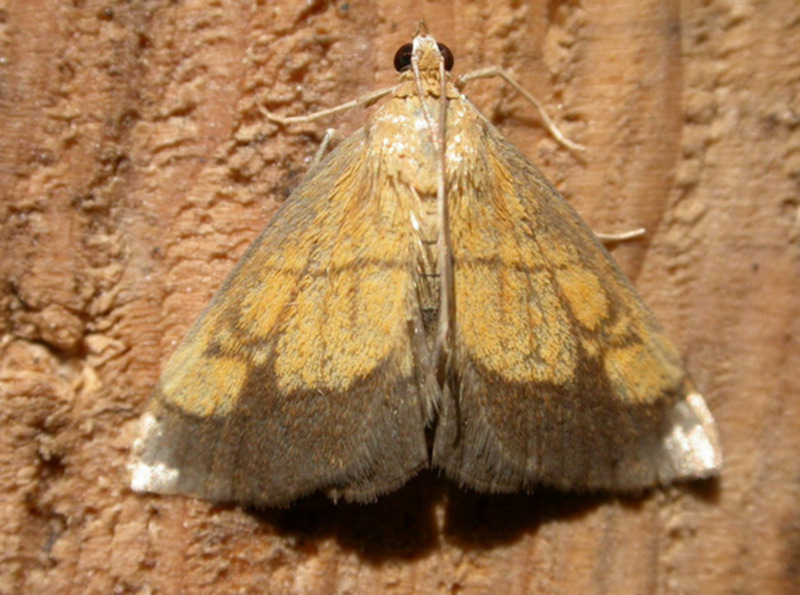 The seldom-seen adult moth of the orange-striped oakworm is really beautiful. 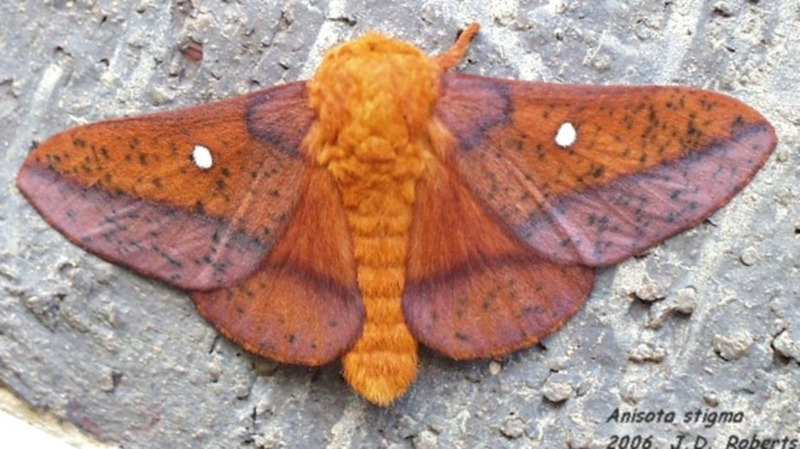 It has pale purple and orange wings with one bright white spot, and a thickly furred body. The adults do not feed, which may explain why the caterpillars eat so much! Does it sting? No. The horns are only for show. Will it seriously damage plants or trees? Yes, although not enough to actually kill or seriously hurt a tree. They will eat a lot of leaves, though, and make the tree look a little bare near the end of the summer. Can you raise it to an adult? Yes, and I think it's worth it so you can see the freshly-hatched adult. This species burrows into the ground to pupate and does not spin a cocoon. This relative of the tomato hornworm becomes a truly huge moth. 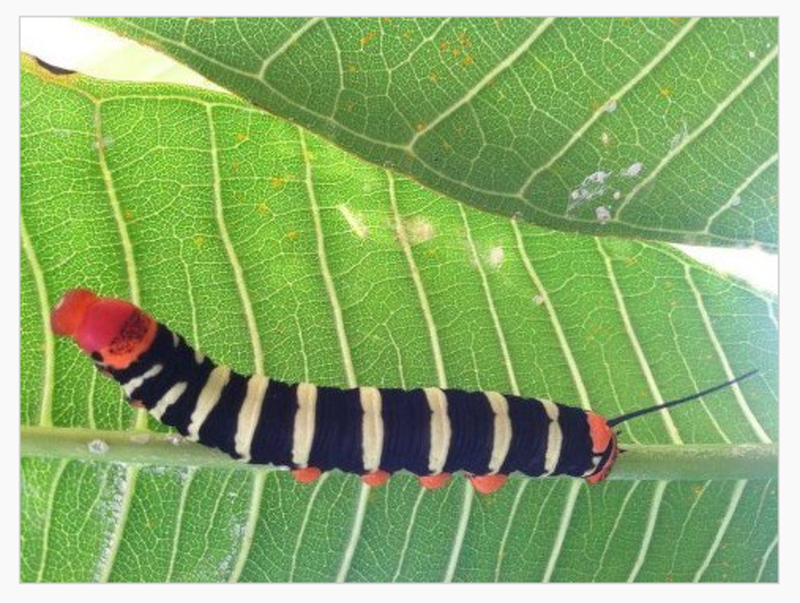 The larvae are often seen in groups feeding on frangipani, and the bright stripes on the black serve as a universal warning that the caterpillar tastes bad or is otherwise dangerous. 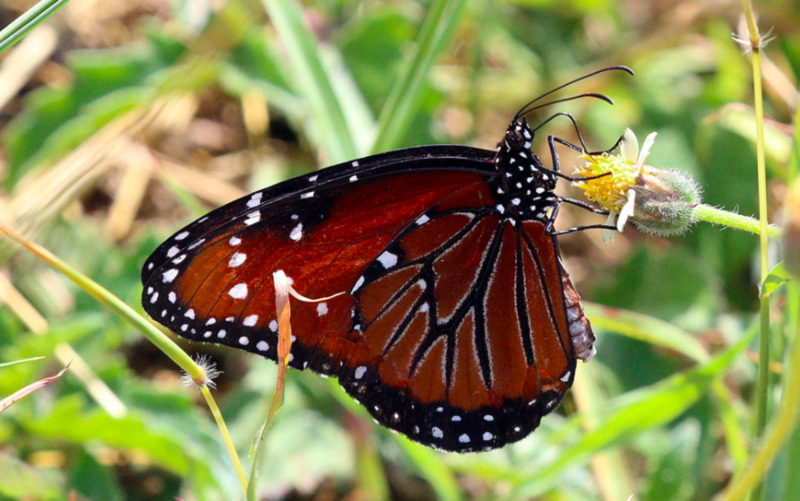 Predators will shy away from striped caterpillars with these colors, since they often taste bad. Of course, some perfectly edible species have also evolved these colors, since being protected means you're more likely to reproduce. As I mentioned, this moth is big. In Belize, a young boy once brought me a live tetrio sphinx in a sandwich bag. It barely fit in the bag, and it looked like it was about to tear the plastic open and come after us! Does it sting? No. The horn on the tail is only for show. What does it eat? Almost exclusively frangipani, but sometimes other related plants. Will it seriously damage plants or trees? Yes, it can, since frangipani tpically have few leaves to begin with. Is it rare? It's common in South and Central America, and occurs in Florida too. What does it turn into? 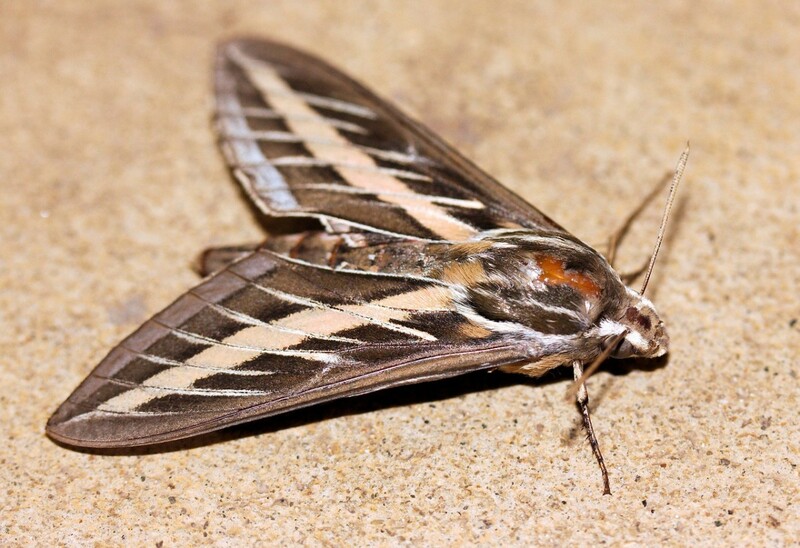 It becomes a big, strong moth, one of a large group known as "hawkmoths." Can you raise it to an adult? Yes, but it's not easy since they like to feed and travel in groups. This is a very cool-looking caterpillar that is quite often found in gardens. 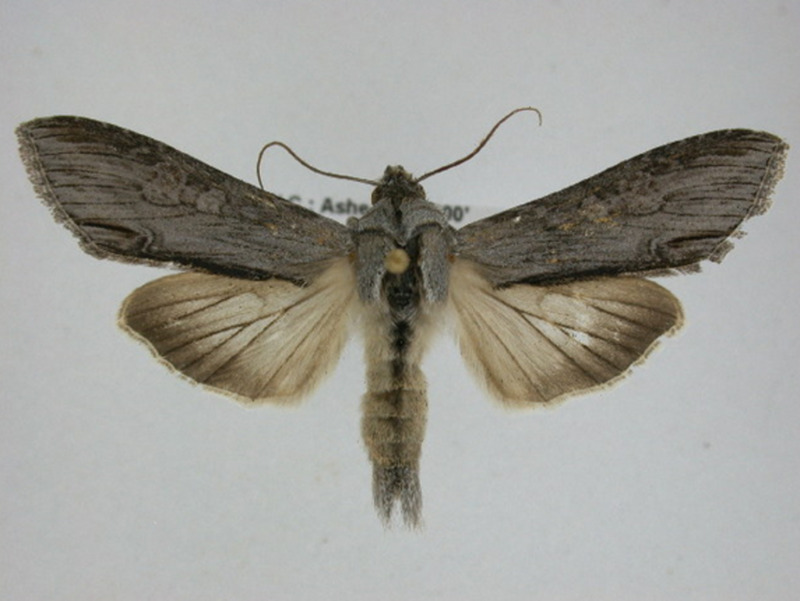 They eat cabbages and other plants, and are often found in the company of other cateprillars, especially cutworms. Like cutworms, zebra caterpillars often roll into a ball and drop off the plant when they're disturbed. 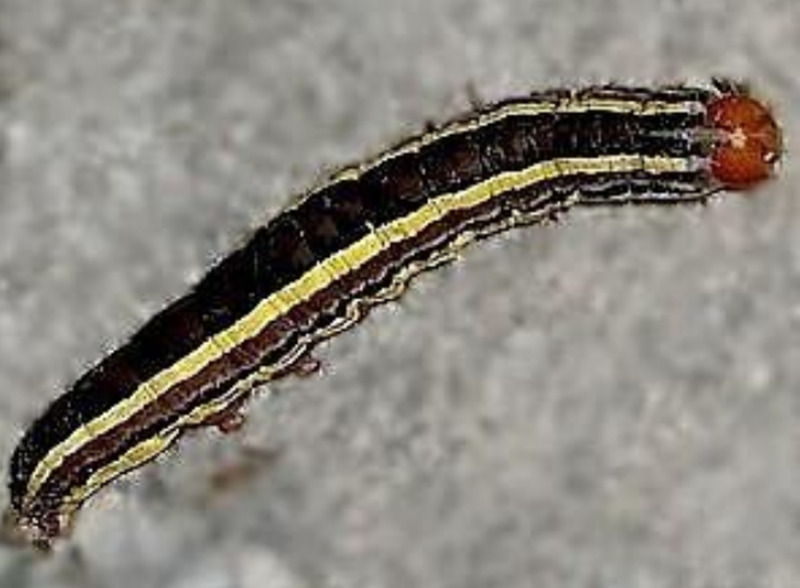 The moth of this striped caterpillar is rich dark brown with subtle darker markings. They are very common around lights, where they typically blend in with the other similar-looking species. Will it seriously damage plants or trees? Yes, if there are enough of them. This striped caterpillar is also often called the zebra caterpillar, and it does look a lot like the previous species. It is not closely related, however, and feeds on different plants. 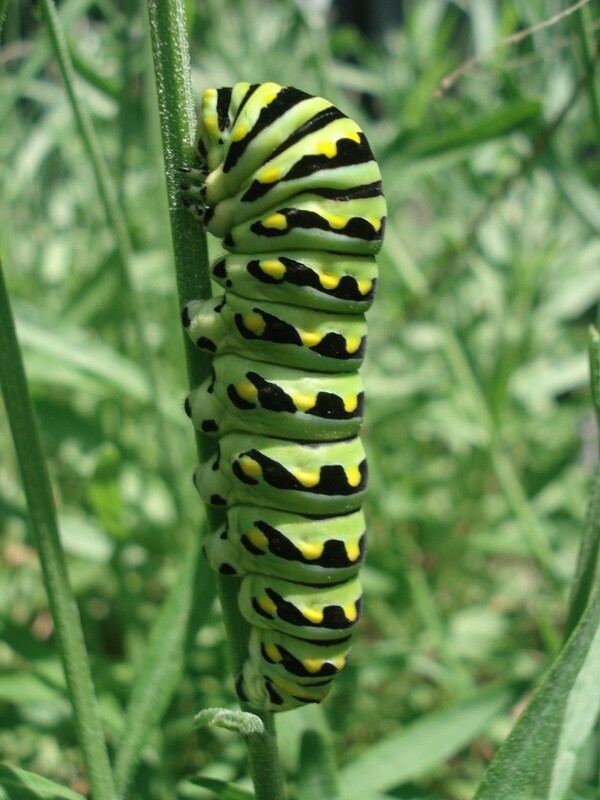 You won't typically find this caterpillar in your garden but you might find it in open areas where there are goldenrods and asters, its food plants. I have found them in marshy, semi-flooded areas as well as open fields. This caterpillar becomes a sleek gray and brown moth. When they rest on a branch, they look just like a broken-off twig. 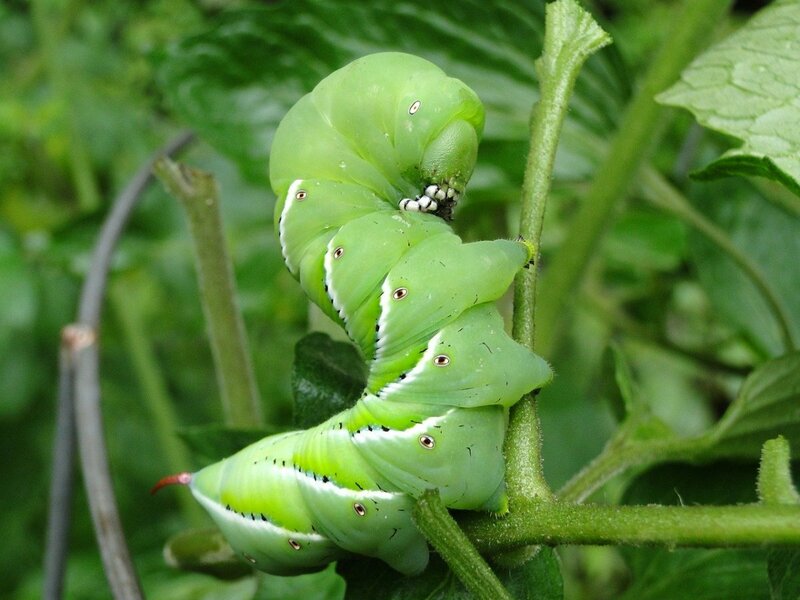 This insect is a close relative of the tomato hornworm. 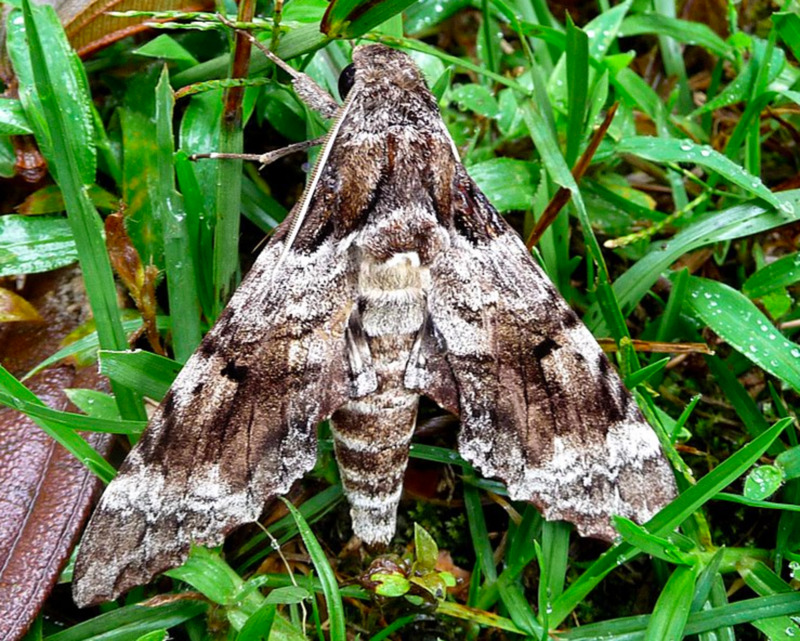 They are both in the family Sphingidae, which is a very large group of moths that occurs world-wide. The white-lined sphinx is very common, and the caterpillars are often found feeding on a wide variety of plants, or crawling on the ground as they look for a suitable place to burrow down and pupate (sphinx moths do not typically spin a cocoon). 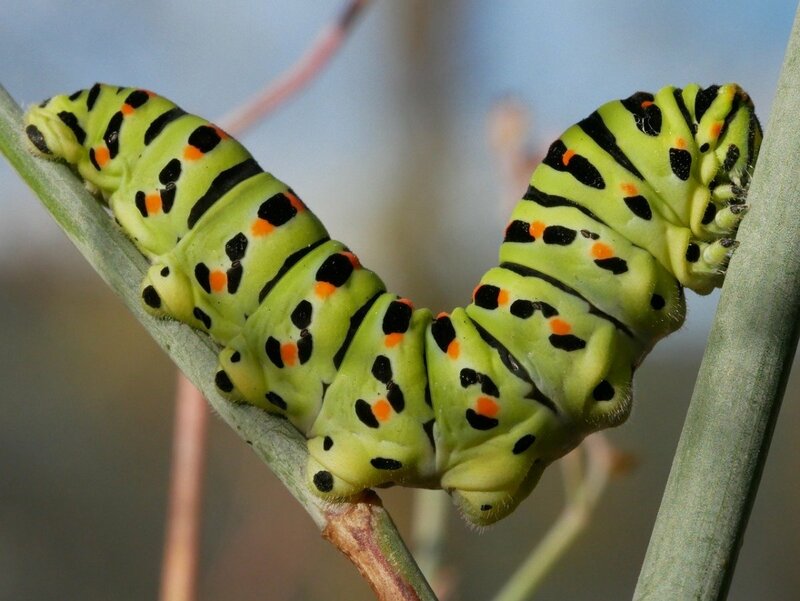 These caterpillars come in many colors and pattern forms, and often two white-lined sphinx caterpillars don't even look like the same species. The striped form pictured here just one of the forms the larvae can take. What does it turn into? It becomes a big, beautiful moth, one of a large group known as "hawkmoths." Can you raise it to an adult? Yes, these are easy to raise. Keep a folded paper towel in the bottom of the container so it can pupate. 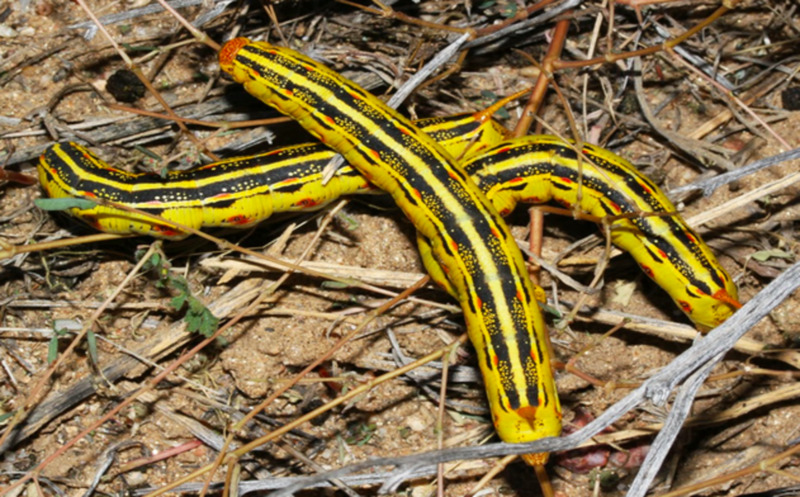 These caterpillars are seldom found alone -- they are one of many "gregarious" species that find safety in numbers and often occur in groups of several dozen. The azalea caterpillar eats, you guessed it, azaleas, and an infestation can essentially wipe out a garden. This species has several relatives, most of whom occur in groups, including the "walnut caterpillar" and other common species. 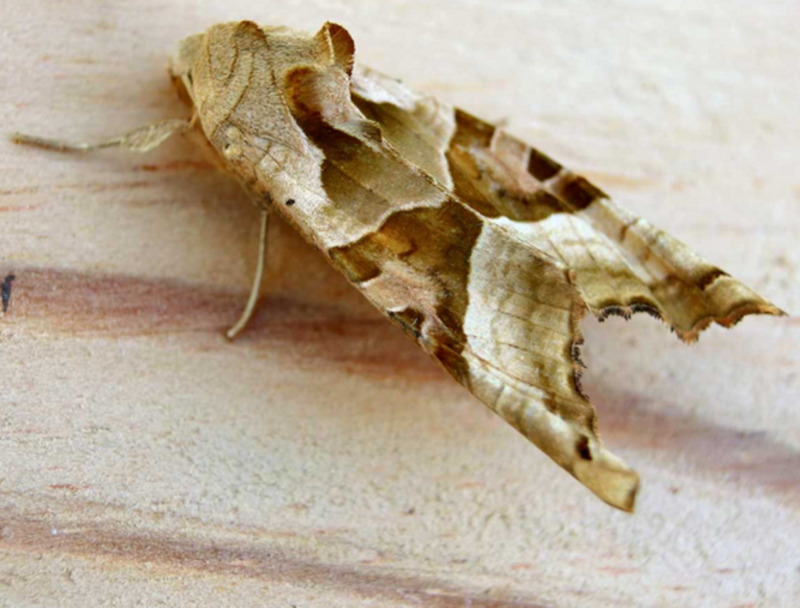 The moths are pretty but generally go unnoticed, since when resting they look exactly like a brown, curled-up leaf. Control of azalea caterpillars generally means putting on garden gloves, picking the caterpillars off by hand, and smashing them into your compost pile. It will take a few minutes and is not exactly pleasant work, but chemicals and pesticides are seldom necessary for a localized infestation in a garden patch. What does it eat? Almost exclusively azaleas. Will it seriously damage plants or trees? Yes, since they occur in large groups. What does it turn into? It becomes a medium-sized, furry brown moth. Can you raise it to an adult? Not easily, since they occur in groups. This moth occurs in Europe and North America, although it is seldom seen due to its very effective dry-leaf camouflage. 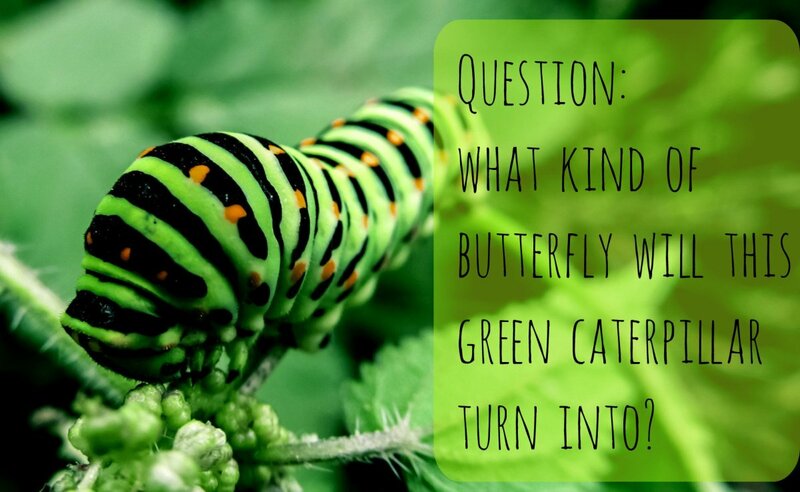 The caterpillar is also well-camouflaged on its food plant, and is one of many green caterpillars that you might find in your garden. 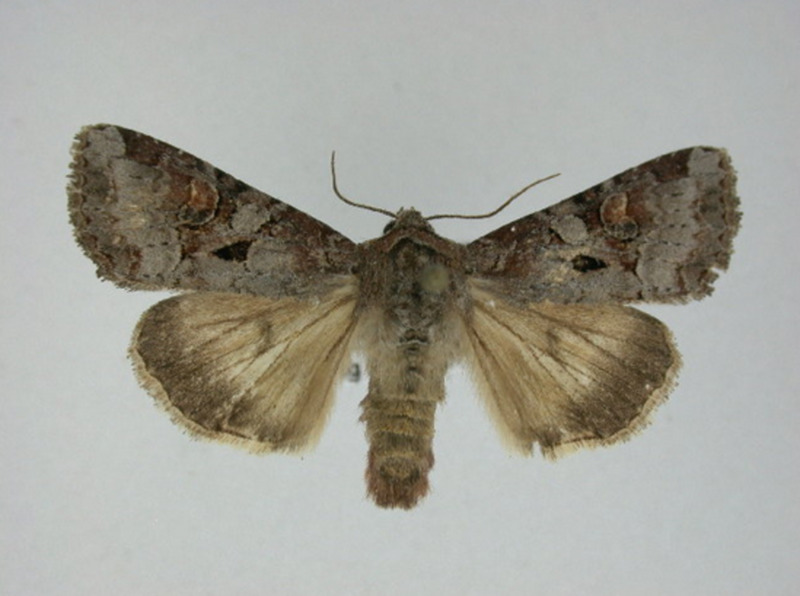 The single white stripe is one way to identify it, but there are several similar species and the best way to be sure is to raise it to the adult moth. You can do this by keeping it in tupperware or jar and providing fresh leaves of the kind you found it on. Put paper towels on the bottom of the container and it will eventually pupate and hatch into a moth. It does take time, but your patience will be rewarded. What does it eat? May common trees and shrubs. What does it turn into? It becomes a pretty brown moth that looks like a dead leaf. This species is sometimes referred as the "zebra caterpillar," which is confusing, since there's another species with that name, as well as a butterfly species called the zebra. In any case, this very common striped caterpillar often shows up in your garden in the company of other cabbage-eating caterpillars. If there are enough of them, they can do serious damage. Control means picking them off by hand, although you might try diluted soapy water, which deters them from feeding. For such a showy caterpillar, the adult moth is a very plain light brown, and often goes unnoticed. What does it eat? Many plants, but it prefers cabbages and other crucifers. Will it seriously damage plants or trees? Yes. What does it turn into? It becomes a small brown moth. Can you raise it to an adult? Yes, technically. This butterfly is one of several similar species that can be very common at times. 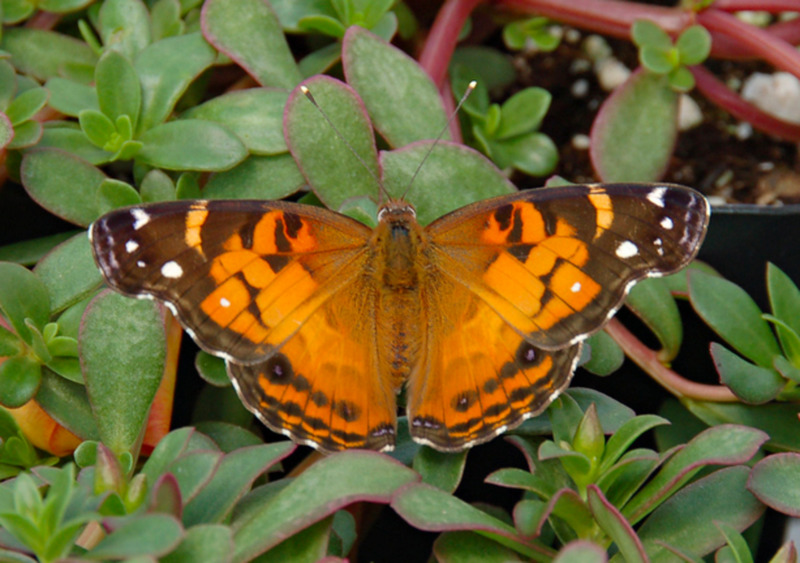 Its close relative, Vanessa cardui, is the kind that comes with butterfly kits and habitats. In these kits, it feeds on a prepared "paste" that provides all the nutrients it needs, and the adult emerges after a few months. Vanessa virginiensis looks very similar, but the striped caterpillar is distinctive. The adult butterfly is a beautiful bright red-orange, and may mimic the similar-looking monarch butterfly (see above), which is thought to be protected by the toxic sap of the milkweed that it eats. Does it sting? No. The spines are not poisonous. What does it turn into? It becomes a large orange butterfly. Can you raise it to an adult? Yes, these are easy to raise. The gulf fritillary is one of the most beautiful butterflies in North America, with crimson wings marked by black and bright silver spots. It's common in the southern states but seldom seen in the North. 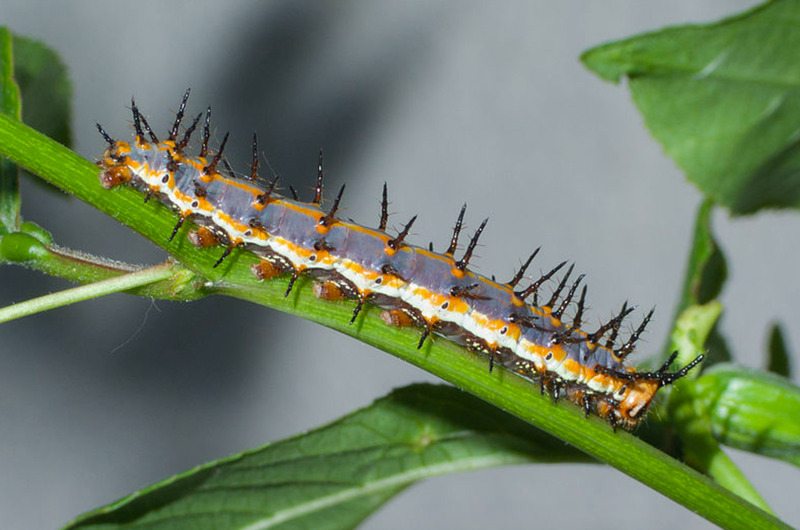 The orange and gray striped caterpillar is found on passion flower vines, and the toxic sap of the vines may protect this species from being eaten by predators -- which may be why the butterfly is so brightly colored. 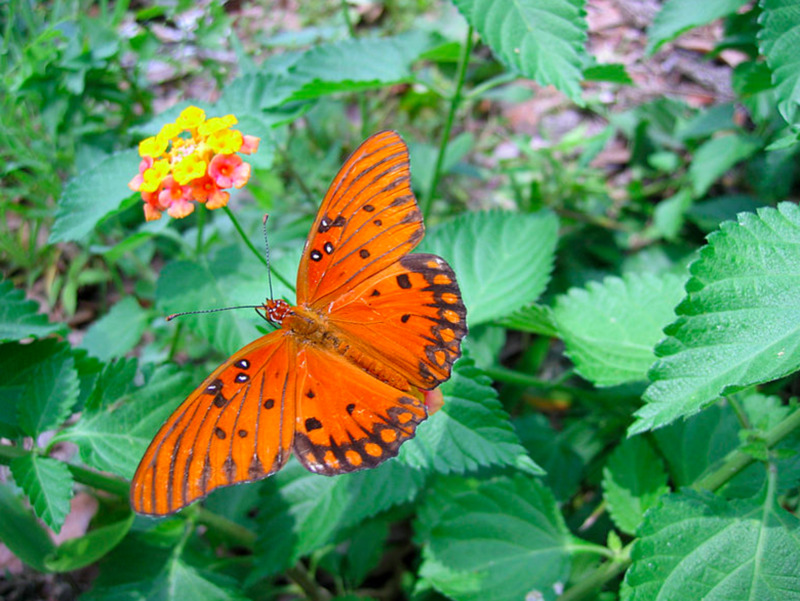 The gulf fritillary is one of many species that may increasingly be found further north due to global warming trends. What does it eat? Almost exclusively vines in the Passiflora group. Is it rare? No, but it is not typically seen in northern states. 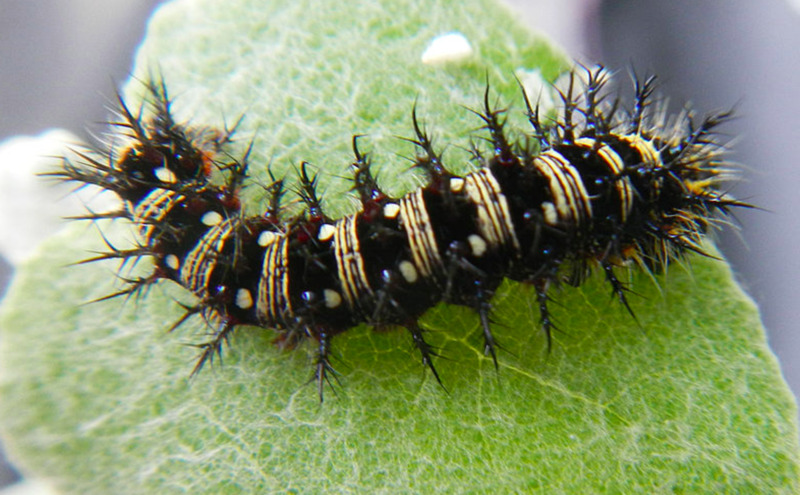 This green and white striped caterpillar is sometimes found in groups on the lower branches of maple trees. 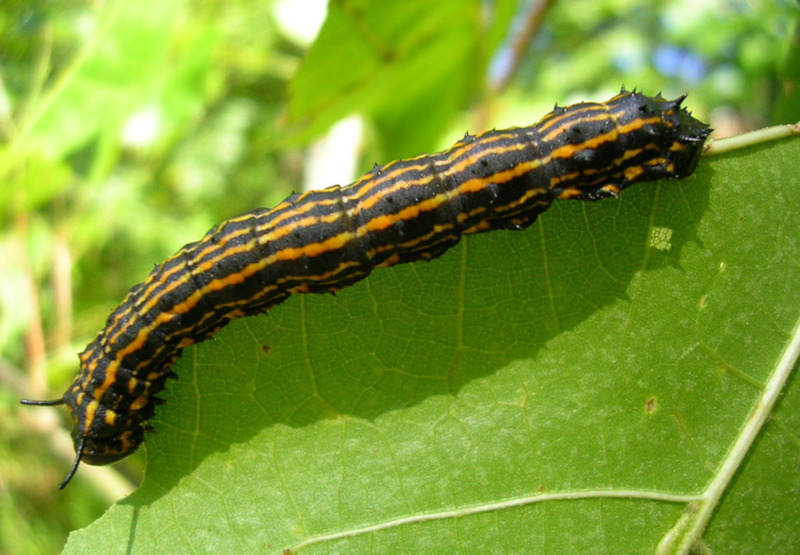 It's closely related to the orange-striped oakworm (see above), but unlike that species it does not typically occur in enough numbers to do any real damage. The moth that this caterpillar becomes is really spectacular -- I have heard it referred to as the "kool-aid moth" due to its unusual combination of colors. A newly-emerged rosy maple moth is a truly beautiful thing, with rich yellow and bright pink wings and thick yellow "fur" on the body. Is it rare? No. This species is found almost everywhere, but is more common in the northern states. What does it turn into? 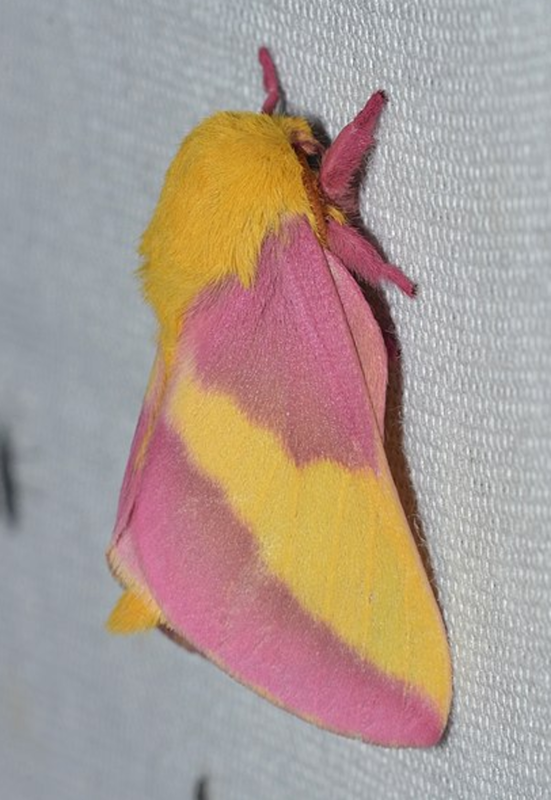 It becomes a beautiful pink and yellow moth. 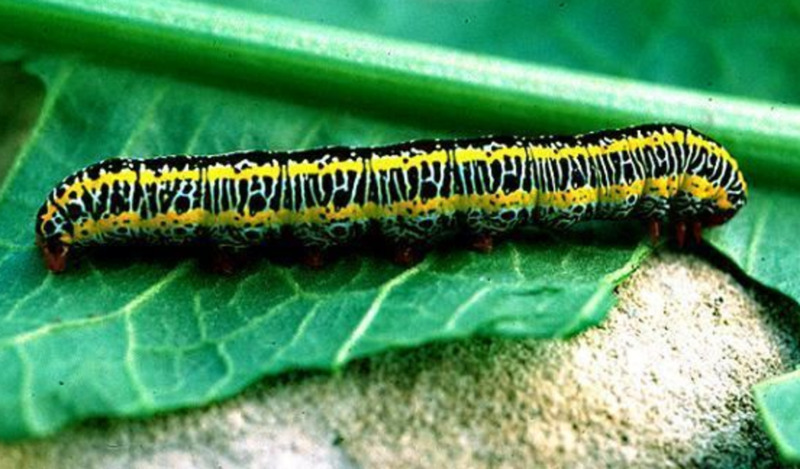 Did you find a striped caterpillar that you're trying to identify? 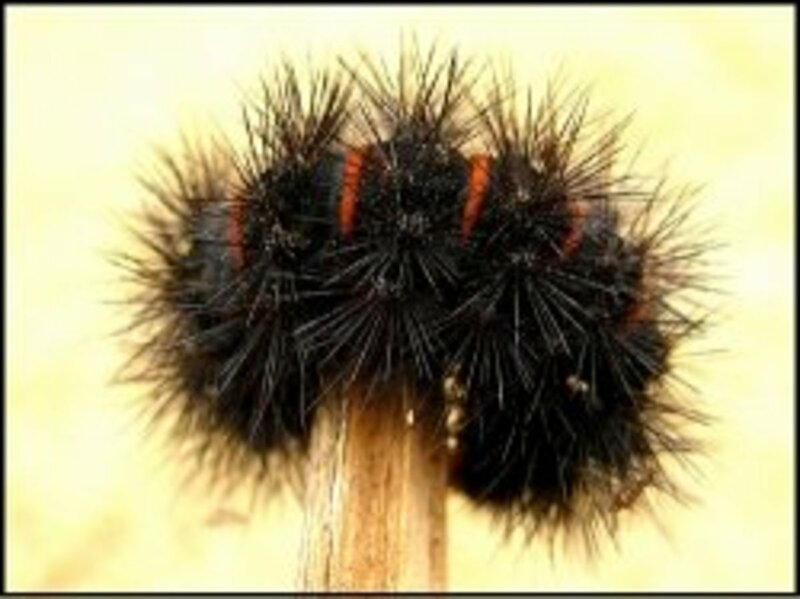 Furry Caterpillar Identification -- Here's a guide to help you identify the furry, fuzzy, or hairy caterpillar you found. Green Caterpillar Identification -- This article has photos of many green caterpillars -- do you see yours here? Black Caterpillar Identification -- Many caterpillars are black or dark-colored. 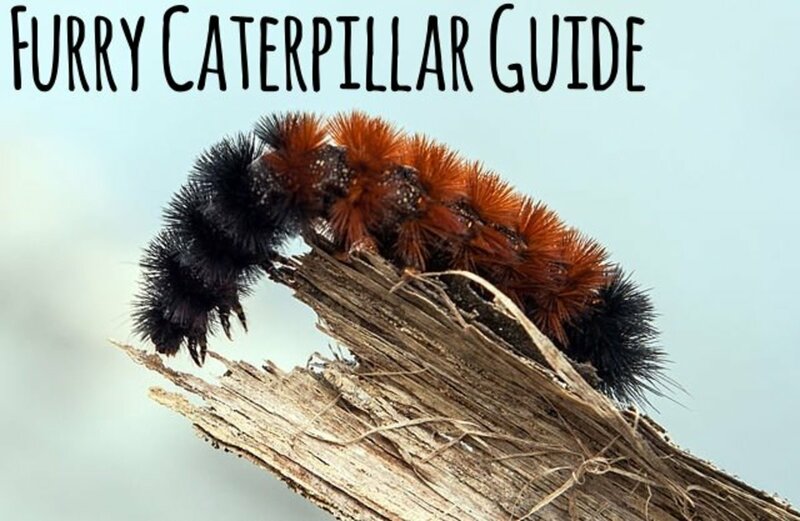 This guide will help you figure out what kind of caterpillar you have. I don’t really know what mine is because it, looks like the eastern tent caterpillar but instead of the white line on there backs mine is red so I don’t know if it’s just a rare one I didn’t touch it just Incase if it was poisonous.